Less known is that Max Steiner fashioned his Tara theme from another melody that he had unveiled in They Made Me a Criminal, a modest Warner Bros. film released eleven months before David O. Selznick’s production of Gone with the Wind. This melodic forerunner had its own predecessor, with Steiner spinning it from a simpler prototype used in Crime School (1938). The earlier melodies share several features that were not extended to Tara: namely, walking bass accompaniments, blue notes, and swung rhythms. For Crime School, Steiner even instructed his assisting orchestrator to strive for something “sort of ‘American’” and “hot.” Steiner also wrote the n-word next to “blues,” acknowledging a cultural debt in blatantly racist terms. For They Made Me a Criminal, Steiner counseled his orchestrator to emulate George Gershwin, who mingled jazz and symphonic idioms in Rhapsody in Blue. With the benefit of hindsight, Steiner’s concoction for that film sounds like a blues-sprinkled Tara theme. The first entrance of the Tara theme in Gone With the Wind‘s main title. 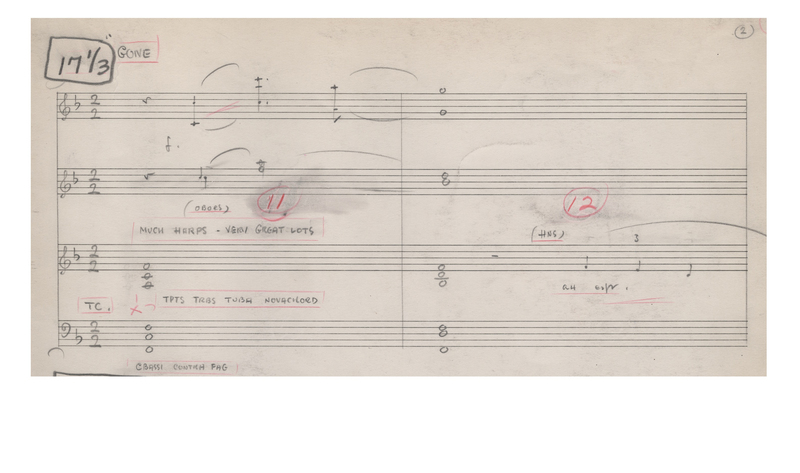 Although the theme was composed by Steiner, Hugo Friedhofer arranged the main title music (shown here) and signed it “Steiner + Co.” Image courtesy of L. Tom Perry Special Collections, Harold B. Lee Library, Brigham Young University, Provo, UT. Why did Steiner turn to these melodies when contemplating Tara? The earlier films showed young, inner-city Irish Americans struggling against overwhelming odds to escape poverty and ascend the social ladder. The characters’ ethnicity and “whatever it takes” attitudes correspond to Scarlett’s. But Steiner’s incorporation of sounds associated with jazz and the blues—the expected musical accompaniment for depicting hard, city living in 1930s films—gives these melodies a racial inflection that remains relevant in Gone with the Wind. To carry the sounds of jazz to the fields of Tara would have been jarringly anachronistic. But it is striking that Steiner’s adaptation wipes away all traces of a racialized and racist past: walking bass lines are replaced with plushly sustained chords in the brass, swung figures are sharpened into square, dotted rhythms, and blue notes are replaced with overzealous harp arpeggios. One annotation in the score even reads “quite some harp.” (Louise Klos, one of the harpists, was Steiner’s wife.) Whether Steiner intended it, the process of drawing on, then marginalizing, African-American culture reflects through music the troublingly majestic portrayal of plantation life that characterizes the film. Of course, most in the audience would not recognize the Tara theme as adapted from these earlier models. Also lost would have been Steiner’s decision to draw his musical emblem for Tara from melodies born of blues and jazz (or at least Steiner’s impression of them). Did Steiner, not above writing racist slurs in the privacy of a handwritten score, make this selection to plant a provocative irony? That just as Scarlett’s family depended on enslaved African Americans, so the Tara theme admitted through disavowal its indebtedness to African American culture? At the very least, Steiner felt compelled to qualify Gone with the Wind as a “human document, dealing with white people,” an observation that is obvious yet necessary. 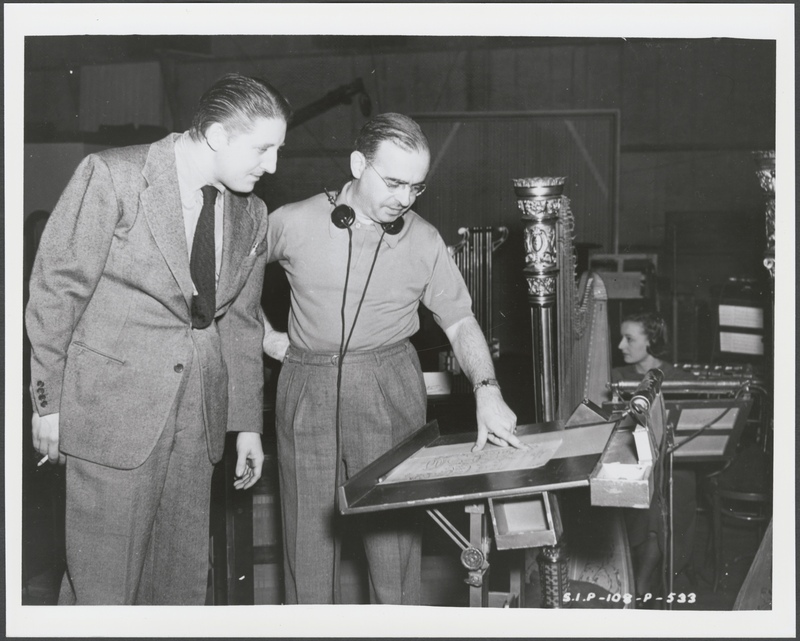 Max Steiner points out a passage in his score to Lou Forbes, music director for Gone With the Wind. Forbes’s tasks included monitoring Steiner’s recording sessions with the orchestra. Image courtesy of L. Tom Perry Special Collections, Harold B. Lee Library, Brigham Young University, Provo, UT. But the tale does not stop there. Steiner did not write the initial presentation of the Tara theme heard in the film’s main title. He delegated the plum task to Hugo Friedfhofer, an orchestrator who had assisted Steiner on They Made Me a Criminal. With Steiner’s theme in hand, Friedhofer got to work setting what would become one of the most famous passages of music ever to come out of Hollywood. Friedhofer then passed his sketches—signed “Max Steiner & Co.”—to Reginald Bassett, who arranged Friedhofer’s arrangement for full symphony orchestra. The questions this music poses are raised quietly. 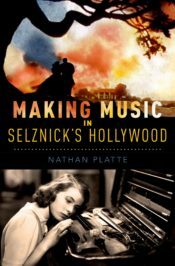 And they may have only been heard—if heard at all—among the musicians who toiled in Hollywood, composing, arranging, and recording one another’s work day after day. But while Gone with the Wind marks an exceptional effort in the history of film, the shared construction of its music points to a common, collaborative dynamic in Hollywood music-making that often developed over multiple productions, like the Tara theme itself. As for music’s capacity to both celebrate and challenge the film it announces, Gone with the Wind stands apart, an appropriate distinction for a film that engenders sympathy for diverse characters while holding a flawed vision of humanity in its heart. Featured Image: “Hollywood Sign Iconic Mountains Los Angeles” by 12019. CC0 via Pixabay. Nathan Platte teaches music history at the University of Iowa.